This 6' x 6' foot platform with a clearance of 21 inches is ideal for utilizing otherwise unusable space where conduit or pipeline runs across a floor space. Stairs are strong two step units with safety surface tread, and handrails offer sturdy support for added safety. Platforms have a non-slip surface to help prevent trips and falls. Units ship broken down for lower shipping fees. Assembly is easy bolt-up. Stairs and support towers MUST be anchored to the floor before use. Load capacity: 50 psf. For additional sizes, please call. Ground to Platform Surface: 27"
Each work platform is built using a modular system consisting of stairs, platforms, handrails, ladders and support towers. Each component has specific features that contribute to the overall strength and durability of the completed work platform. Custom work platforms may be created by selecting the appropriate components to construct the needed configuration. Stair units arrive ready for assembly. Each stair unit includes stringers, treads, handrails and all hardware for assembly. Steps are set at a 9" rise and step width of 32". 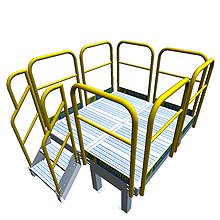 Each tread has a slip resistant surface and handrails are finished in ANSI Safety Yellow. Stair units are available in 2 through 11 step configurations upon request. Stair units MUST be anchored to the floor before use of the crossover, or serious injury could occur. Platforms are bolted to stairs, ladders, and other platforms on any side. The bolt hole configuration is the same on all sides of the one piece stamped aluminum platform. Stamping technology minimizes welds, piecing and additional parts while increasing overall strength. This higher quality production also means each piece is exactly the same as the one before it. Each platform easily fits onto stair units, other platforms, ladders, or support towers. Platforms are sturdy enough to span 3 platforms wide and 3 platforms deep before additional support is needed. When exceeding 3 platforms bolted to each other, add support towers for intermediate support. Support towers add versatility to your crossover configuration. Place a support tower where more than 3 platforms span an open area, at the end of a dead-end span, or to make turns in a stair configuration to save floor space. Each support tower is a two-legged structure with the same bolt-hole configuration as the bottom of the platform. Each support tower must be anchored to the floor in order to provide adequate stability to the work platform it is part of. Hand rail units include toe-boards and are universally sized to fit the bolt-hole pattern of the platform. Hand rails are constructed of 2" dia. round pipe. The durable hand rails are finished with ANSI Safety Yellow for high visibility and pleasing appearance. When space is too confined for adding stairs, consider installing a ladder. While ladders are not convenient for carrying materials, they do provide access to service ports and equipment maintenance doors in tight places. Each ladder module is based on a 9" rung space and 26" step surface. Bolt-holes match the platforms, making it possible to create a work platform at important access points for working on equipment and machinery. Handrails are included on each ladder. Width & length of floor space crossover is being installed in. With that information we can configure a work platform that meets your needs.